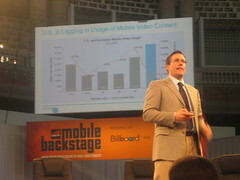 Not that many countries outside Asia are using it in a big way, but proportionally fewer Americans are watching mobile TV than anywhere else surveyed, Nielsen Mobile VP Jeff Herrmann told the Mobile Backstage side conference on mobile entertainment in Barcelona. Good post. It was really helpful for me. where can I find more information about this? How can this statistic be made? Mobile TV is only mobile TV when it uses technologies such as DVB-H, DVB-T and DVB-S. Mobile TV over data is not mobile TV, it is a really poor user experience, and high data usage. Hence 36% of devices do not support true mobile TV. Once Mobile TV uses DVB technologies, then the update will be expected to increase as costs to the user "SHOULD" be none, as commercial sponsored channels cover this expense.